Recycling, renovating, refurbishing, converting… all of these words remind me of DIY projects that help us find new uses for old items. Whether the idea is to save money, to be more conscious of the environment, or to be creative, I love hearing earth-friendly tips from other families. 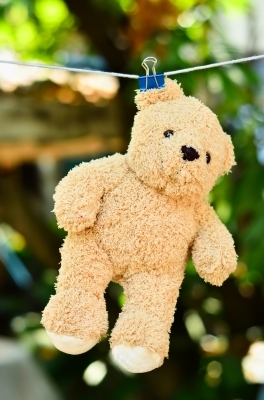 So today in the spirit of Earth Day, I’m going to share one of my favorite earth-friendly, but very old-fashioned, DIY ideas: hanging laundry out to dry on a clothesline. This might not sound all that exciting or revolutionary to you… but stay with me. I promise, there are many perks! I encourage you to rediscover this old technique… because it will renew your spirit. If your family is like mine, weekends are full of activities including sports, which means that Mondays are great candidates for laundry days. I do not like having stinky sports uniforms hanging out in the laundry room for very long. At some point over the weekend, I normally remind my kids to collect all of their laundry from the hidden recesses of their room, bring it to the laundry room and sort it out. (This also helps with the never-ending chore, “cleaning their room.”) I can’t say that I follow this old-fashioned poem’s advice on the remaining days of the week, although Fridays are definitely cleaning days at our house as well. Ok, so Monday morning rolls around and I honestly look forward to beginning my week with a “clean slate” and doing at least one, sometimes three or four, loads of laundry. Currently, I work from home, so it’s easy for me to incorporate this into my routine. But even when I worked full-time, outside the home, I looked forward to this Monday morning ritual and did a load of laundry before heading out the door. 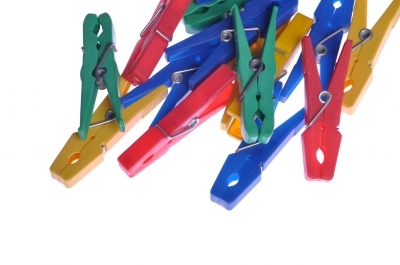 If you don’t already have a clothesline, it’s a fairly simple DIY project to install one. I love the idea that a light breeze and sunshine can work magic on a load of laundry. It’s recycling at its best! 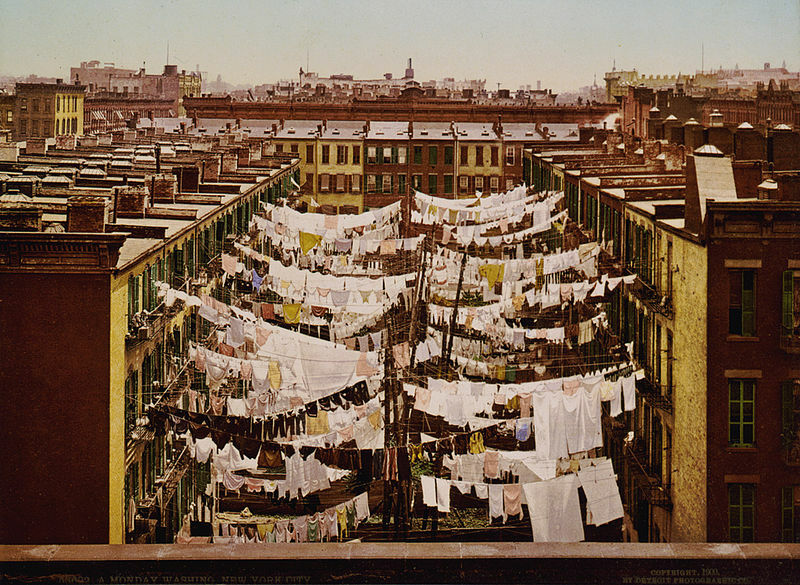 So what are the benefits to hanging laundry outdoors? Morning or afternoon–I often have a cup of coffee nearby! If the temperature isn’t forecasted to go above 60 degrees, then it’s too chilly, in my book, to either enjoy the time outdoors or to adequately dry the laundry. It sounds simple, I know, but my Monday mornings at the clothesline have become a cherished routine. Now that spring is here, this is one chore that I’m ready to plug back into my schedule! How about you? What are some of your favorite earth-friendly tips? Time or money-saving tricks? Ways to renew your spirit? Monday morning in New York City, circa 1900, public domain. How incredible is this photo?! Summer is about two months away, and many of us are dreaming of warm, sunny weather after an especially long winter. Today we welcome guest blogger Naomi Shaw to bring a breath of fresh air, sunshine and outdoor design inspiration from her home in California. 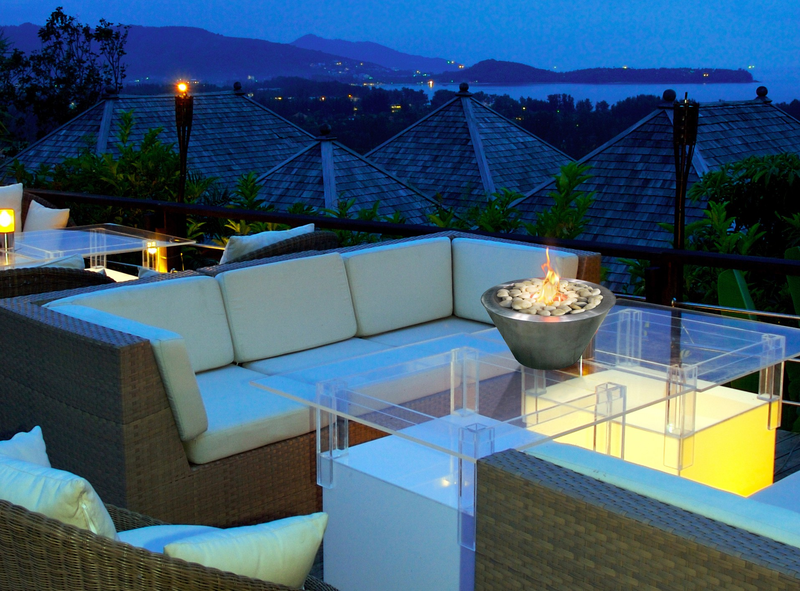 Sometimes all you need to revamp your home is a feature added to your outdoor area. Whether it’s your front yard, backyard or a little art studio in the back, the following ideas can make any outside space a wonderful, enjoyable place to spend time, especially with friends and family. 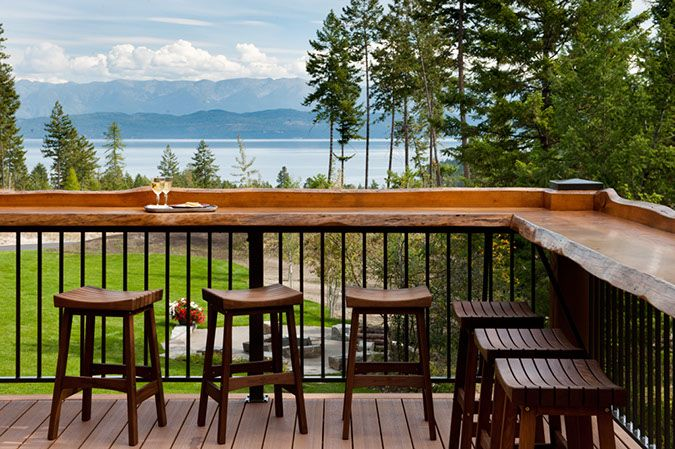 One of the most useful pieces for a gorgeous and fully functional outdoor area is a simple bar. You’ll need a large, flat surface where you can prepare and serve food and drinks for your outdoor guests. You’ll also need some storage space for your outdoor serving dishes, utensils, and other preparation tools. You can build this DIY bar with a little craftsmanship and patience. Here’s an informative step-by-step list from Home at Home, a great resource for homeowners, on how to build a cedar bar all by yourself. Similar to the nostalgic murphy bed, this picnic table can be stored against an outdoor wall in your backyard. Simply buy a picnic table and construct a DIY wall mount. Check out these basic picnic table designs from instructables, a site for creating just about anything on your own. You can raise the table when your kids want a space to play, and lower it down quickly and easily for hosting guests or enjoying time with the fam. Outdoor fireplaces, whether they’re built into your patio or set up like a bonfire, are wonderful places for people to gather. Once the sun dips below the horizon and evening settles in, guests will likely congregate around the warming flames so the conversations can continue, instead of simply leaving because it’s too chilly. Use an environmentally friendly ethanol fireplace, which does not release carbon dioxide into the air as would basic wood and flames. Ethanol fireplaces are easily started and shut off, unlike having to light a flame and hope that it will catch. This type of fireplace does not have to be permanently mounted, if you’re looking for something you can move around the yard. 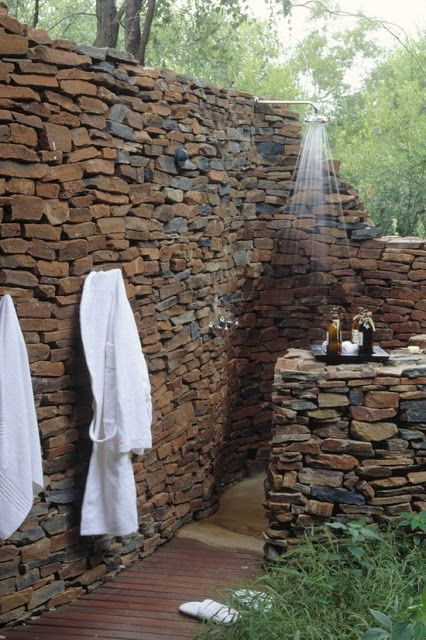 Nothing feels more outdoorsy and refreshing than showering outside. Whether you’re home from the beach and want to wash off all the sand or you just need a breath of fresh air, having an outdoor shower is a great idea for any backyard. Start brainstorming by checking out these 15 different shower designs then get to work by letting Chris Gardner teach you how to build one yourself–very simply! Whether it’s a potting shed or a party shed, a fun place outside of the house to spend time and share stories will make any backyard a great place to be. This DIY renovated shed from ReDesigning Sarah, an inspirational home and family blog, shows just one way you can revamp a lowly box into a lively party destination. If a party shed is not your thing, consider renovating a small shack as a reading room or an art studio. Sometimes all you need to “get away” is a walk outside to your studio. Even just choosing one of these fun projects will turn your backyard space into your own beautiful space you can show off to friends, family, and party guests. Hang out in a party shed, relax by the fireplace, or have delicious meal on your fold-down picnic table. Have you added one of these features to your yard? Thinking about diving into one of these projects? Feel free to leave a comment below and share your ideas and tips! Naomi Shaw is a writer from Southern California. She loves to write about home decor and recently has been remodeling her backyard with her husband and even getting her three boys involved. She is hoping it is all done and set for some summer BBQ’s this year. What would become of such a meaningful part of my life? Well, I am officially “done” with all of this wintry weather and am ready for spring … springing forward, having an extra spring in my step, and that all-familiar pastime of spring cleaning! My family and I have been slowly renovating the upper level of our rambler-style house for a couple of years now. It has taken a good deal of research and planning, yet we are nearly there – just the kitchen to go now! Yes, renovating your house really CAN be this fun! In my blog, “Make Little Changes to Your Home to Create a Fab New Look!” I took you on a tour of our dining/living room area and hallway, demonstrating how just a few small changes (yes, even inexpensive ones) can make a BIG difference in the overall appearance of your home. As I read, research and learn more about renovating, I have also discovered that it is not only possible to make small, inexpensive changes to your house to create a whole new look, but that those changes can also involve using items and accessories you already have in your home in a completely different way to add to your home’s new “image” and décor. In the past, when thinking about recycling, I pictured putting paper and cardboard, and plastics and aluminum, into containers to be reused and redistributed in another form. I thought about composting and conservation. What I didn’t consider is that when you take one item that you might otherwise sell, donate, or throw away – and find another use for it – that is recycling as well! STOP! Don’t throw those leftover pieces of wood away just yet! In the early 2000’s, a couple of years before I met my husband, I was living in Clearwater, Florida. My beloved grandmother (who was actually our neighbor a few houses down the street before we brought her so closely into our lives) had recently passed away from a stroke and I wanted to raise funds for the American Stroke Association in her memory. So I signed up, and trained, for my first half marathon which would be in Negril, Jamaica. When I returned from a successful run, I found that my boyfriend had moved a large, beautifully hand-crafted (by him!) home entertainment center into my apartment’s living room. It was absolutely beautiful, made from red oak and mahogany wood with adjustable shelving, and I treasured it for many years. Over time, I found that this storage unit was also quite versatile and could suit most any home storage need – as a home entertainment center (it’s original purpose and for which it was designed); a display and/or book case; a buffet table; or all of these! When I got married, my husband even had a piece of glass cut for the top to protect it, and so that piece of furniture followed us around until we landed at our current home in Maryland in 2006. 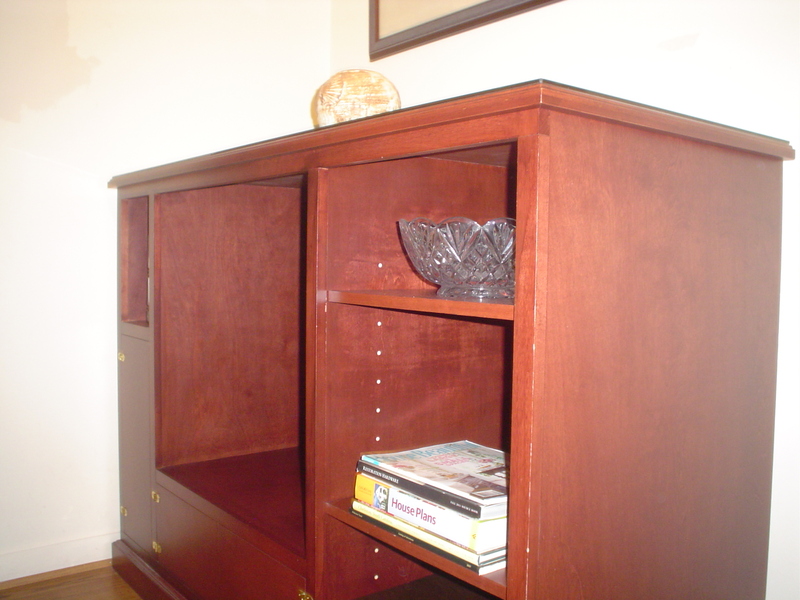 Yes, that “chunky” entertainment center was really THIS close when you opened our front door! Our house is just 1,184 square feet – very small compared to what most people would consider livable square footage. None of the wall space in the living room, or my husband’s office space in our master suite, would “support” the 59 ½” l x 25” w x 32” h center once our other furniture was moved in. All of the bedrooms were too small as well. 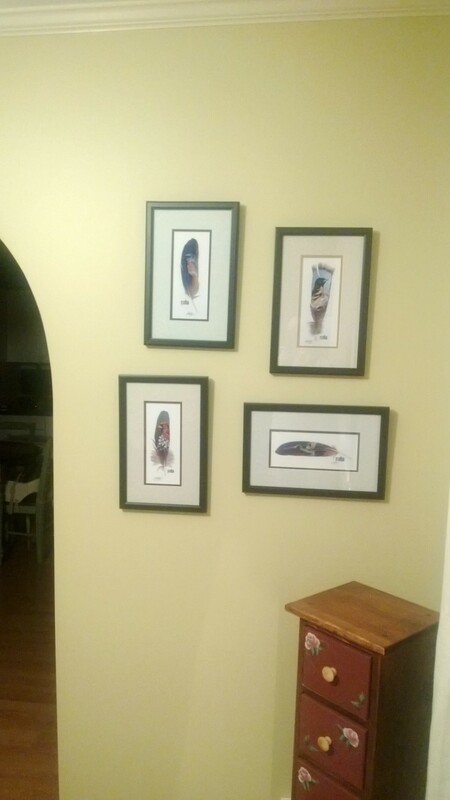 So, we put it along the wall just as you walk in our front door – in the small space we called our “foyer.” I put quotes around foyer because it was more like a few feet of floor space that you squeezed into from the front door before making your way to the living room; or around the corner to the dining room and then on to the kitchen. 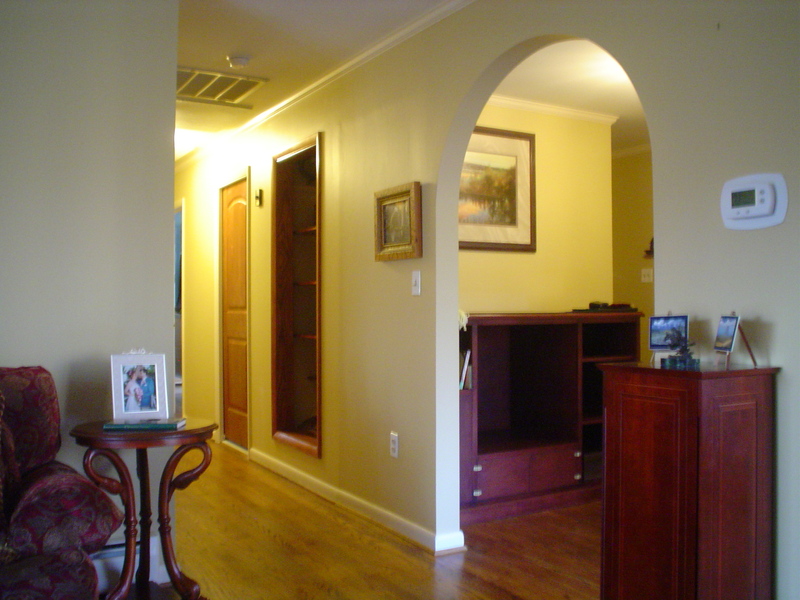 In that space, the center appeared even larger than it already was – taking up a good portion of the entryway space. It was so big that one might even bump right into it when entering the house! Although I had an emotional attachment to this piece and considered it a treasure, when it was time to renovate our foyer we knew it simply could not remain in this space. It was a tough decision, but in the end I decided to let it go. At first, we thought we might find someone special who would cherish the center. When we could not find a good home for it, we decided to sell it and use the money toward our renovations. We put an ad in local newspapers and other advertisement venues; as well as on Craig’s List and eBay – all to no avail. 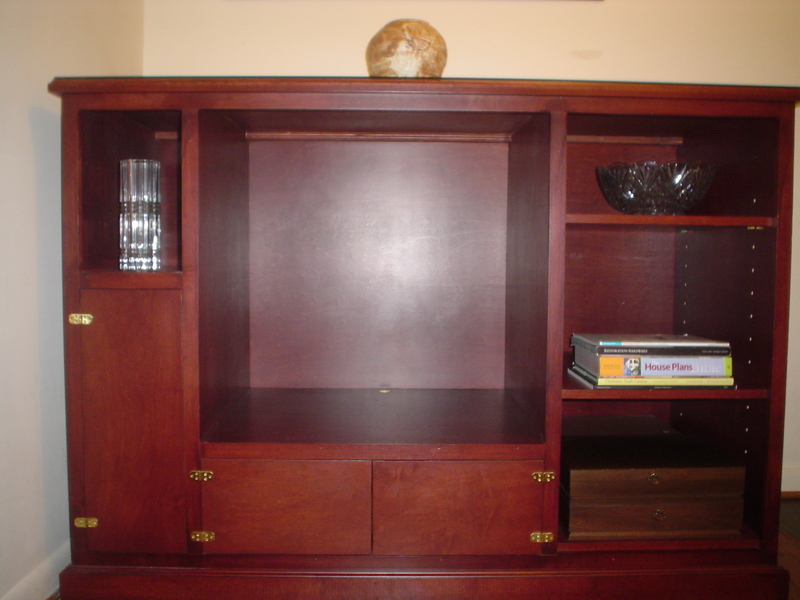 My former entertainment center … How could it possibly ever look as polished and lovely as it once did? This piece simply could not stay, and my husband was about to chop it up for firewood, when our contractor took a second look. “You know…this comes apart.” That was my “ah-ha” moment, and then I knew just what I would do. Besides, if anyone could help me with my idea, it would be our contractor. He goes by “Dr. Dan,” and on his own completes his work intentionally and deliberately. The good doctor seems to be able to custom make just about anything. In my previous renovation blog, I also shared how he had “gutted” a really weird-looking closet in our hallway and created a gorgeous display shelving unit. Truly amazing! So Dr. Dan dismantled the entire entertainment center – right there in the foyer area, piece by piece. 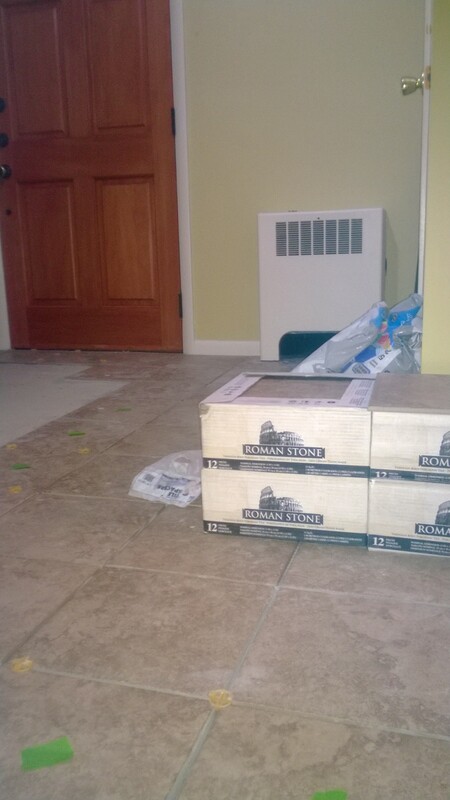 The pieces were then stored so that he could add new tile flooring which we had chosen. We decided to purchase more expensive tiles to make our entrance appear a little more “grand,” even though the style of the floor was actually quite simple. This was the only part of our renovation where we did not “recycle;” rather took on the expense to achieve a goal that may not have been workable otherwise. Besides, we knew that since we had purchased a high- quality flooring, it would last us many years – possibly even the remainder of our time in our house. Previously, there was a “strip” of plastic laminate flooring which was so cheaply made and sloppily installed that it looked very out of place with the genuine hardwood floors throughout the house. The illusion we hoped to create in this way was successful; and our completed entryway/foyer now has a “sweeping” effect as you enter our house. OMG! What a mess! 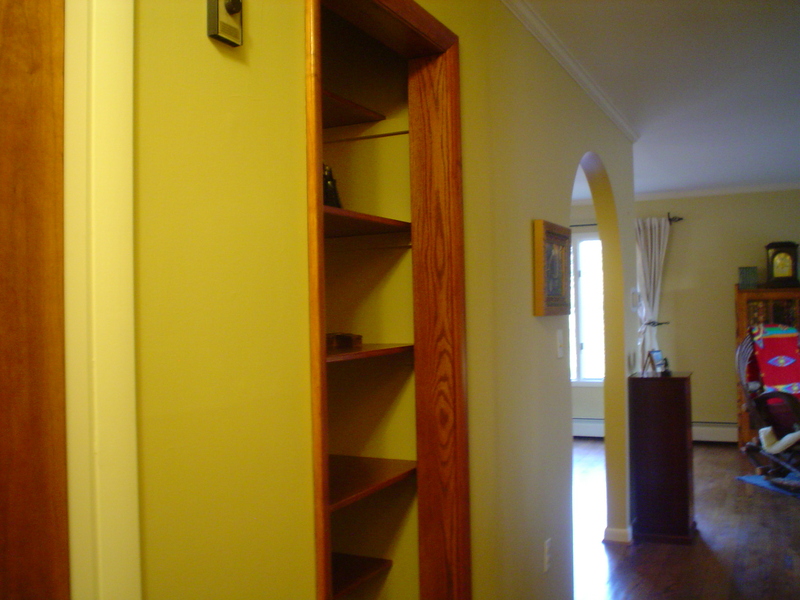 Is there any way this tiny foyer closet can be transformed inexpensively into something more…aesthetically pleasing??? 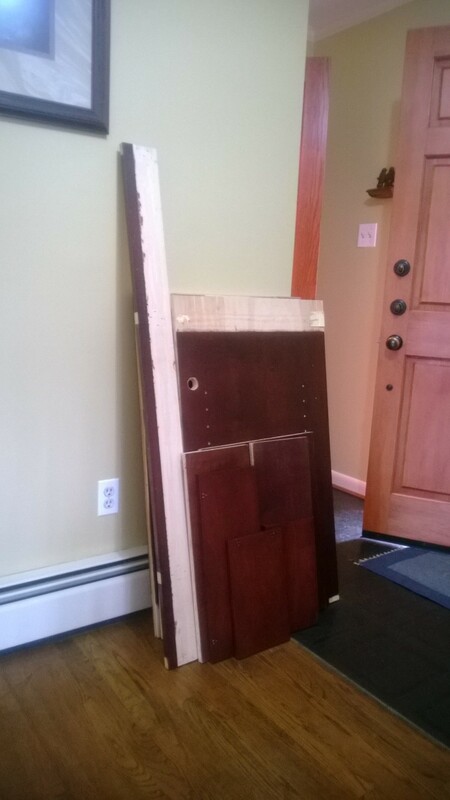 Dan then set to work on our entryway coat closet. 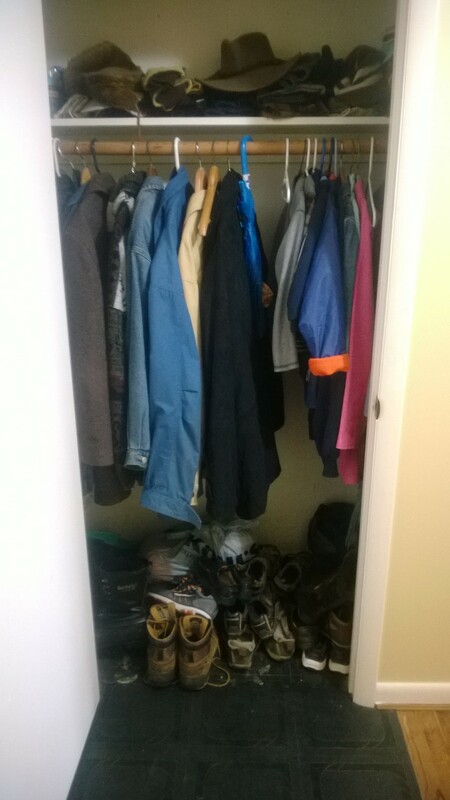 Prior to our renovation, the closet had been small, dark and, admittedly, smelly (once dirty old work boots began rotting away inside!). Soon, however, the old, plain, cheaply constructed outer door was removed and a lovely, dark wooden retro-style “accordion” door was installed in its place – eliminating a door that swings so far open that it takes up half the entryway when opened. 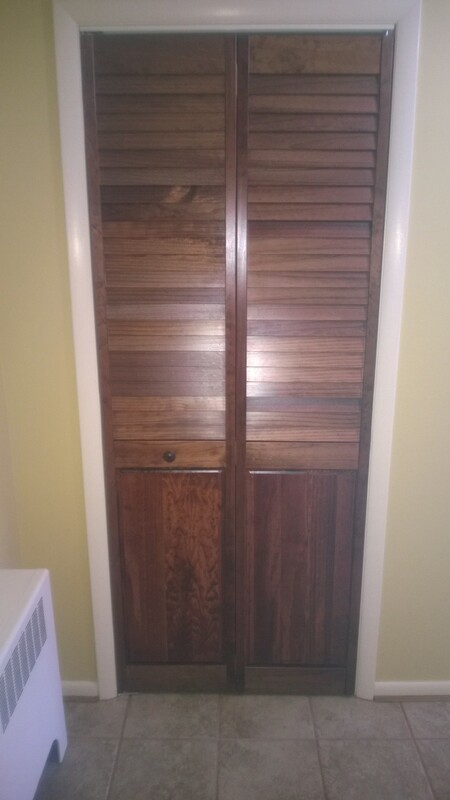 A beautiful new closet door! 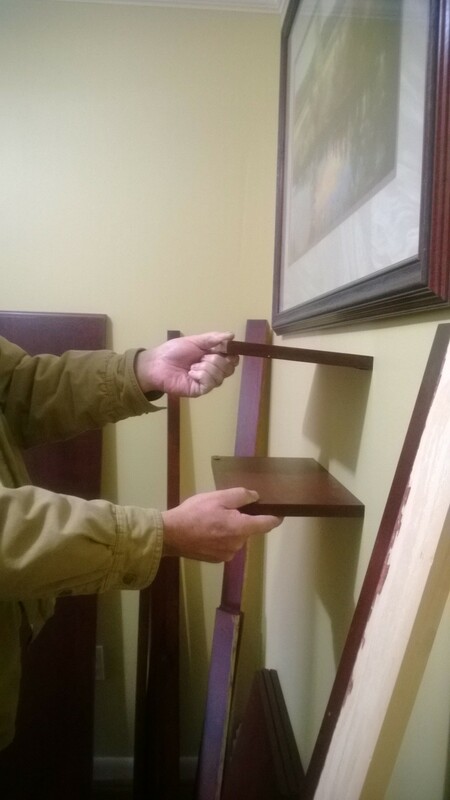 Next, Dan pulled out the makeshift wooden shelf up top and lined the entire inside of the closet with cedar wood (goodbye moth holes in jacket pockets!). The matching makeshift wooden “bar” on which to hang coats was kept in place, however. 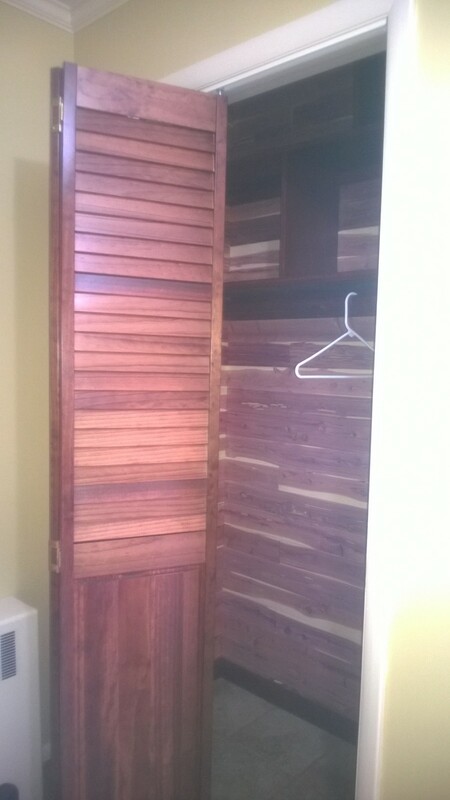 We figured why buy a new one when all our contractor needed to do to improve its appearance and make it match the rest of the closet is stain it? Plus, this was yet another “nod” – this time to all of the do-it-yourself owners who came before us! Though we have had to replace nearly everything you sloppily installed throughout the house, we do applaud your attempt at saving a few bucks. Now, finally, here’s the part where I recycle! Once the entertainment center had been taken apart, our contractor worked hard to keep as much of the shelving and beveled wood intact. He then cut and smoothed all the separate pieces to create partitioned shelving in the closet, matching the design sketched by my husband. Now, we had added pockets of storage in a wonderfully smelling closet – and one that even magically somehow looked larger inside than before! Just like our display shelves in the hallway, our closet had a custom-designed, unique look that when seen one would have a hard time believing it had once been an entertainment center that held a television set and stereo! So if you are looking to change-up an area of your home such as an entryway; closet; or other space in your house, before you troll through Home Depot or Lowe’s, or search online for renovation ideas – simply take a walk around your own home. You just never know what you may find that can be turned into something else and recycled to meet your current renovation needs! A beautiful, warm, and inviting (not to mention larger in appearance) entryway awaits us when we arrive back home. 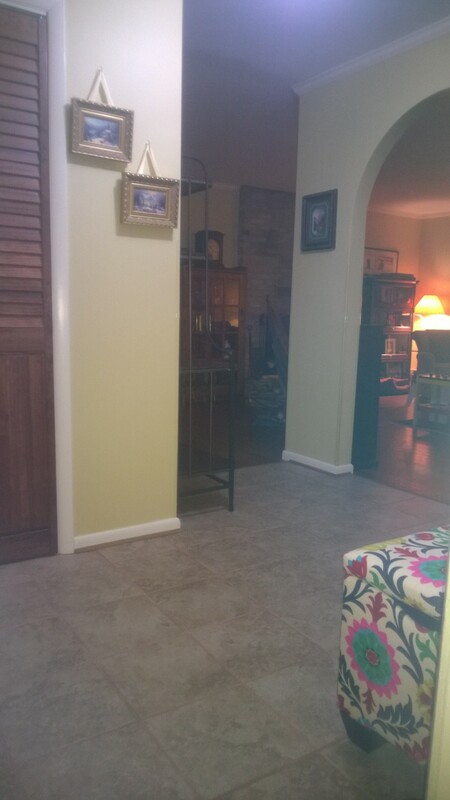 And…I no longer need to use quotation marks around the word Foyer ~ I truly have one now! Happy recycling! Have you found anything in your home that you have turned into something else? Have you embarked on any recent projects you would like to share, along with any interesting renovation techniques or discoveries you found along the way? We would love to hear your recycling and renovation ideas! 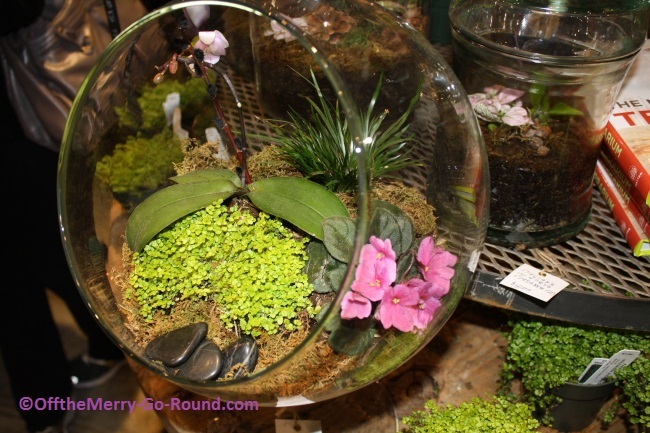 A touch of spring greenery… inside a terrarium! TGIM… Thank Goodness It’s March! Hopefully we’ve witnessed the last snowstorm until next winter, and from here on out, there’s “green” in the forecast, straight through St. Patty’s Day and beyond. Until the sweet green grass of springtime starts appearing outside, here’s one way to bring a little green into your life: By creating a terrarium. 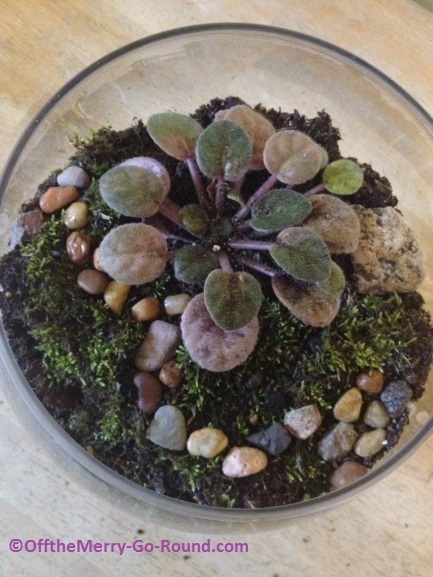 My daughter Kelly & I were inspired to create a terrarium a few years ago, after seeing them at the Philadelphia Flower Show (which is taking place this week–wish we could go again!). What an incredible event! If you ever have the chance to go… do it. It’s a complete immersion into springtime, with inspiration, beauty, advice and entertainment aplenty. 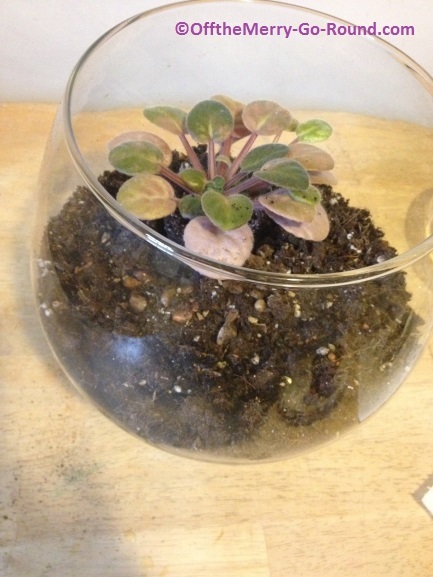 Even if you don’t think you have a green thumb, this is the easiest form of gardening there is, and I’m sure “you can do it.” A terrarium basically takes care of itself. This little ecosystem under glass retains its moisture, and as long as you have a little heat from the sun every day, it produces the humidity needed to keep your plants happy. Our original terrarium was so happy, the plants outgrew the container and we had to transplant them. Now it’s time to create a new terrarium! 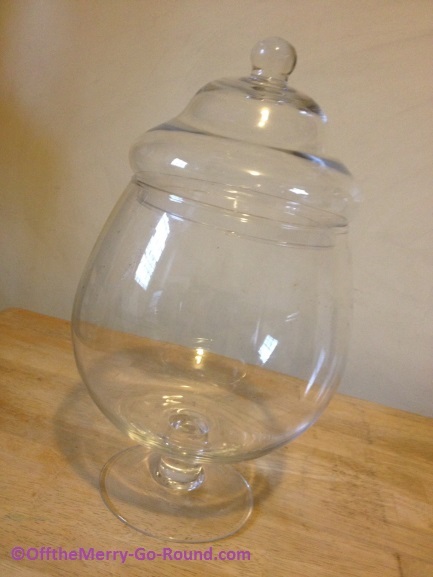 We found this beautifully-shaped glass container at TJ Maxx for about $10. Plants: We’ve had great luck with African violets. 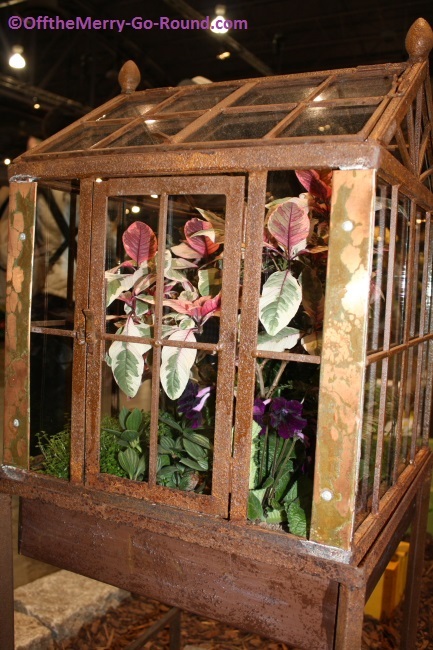 Some of the terrariums pictured above also include ferns and ivy. Aim for plants of the same type, needing the same general amounts of light and moisture. Just follow the sequence of photos below, for step-by-step instructions. 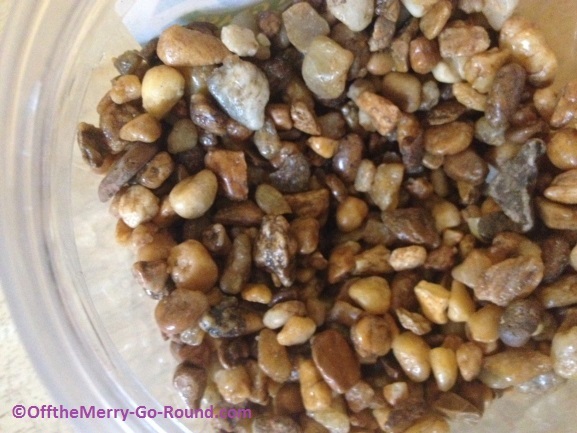 These river rocks, found in the aquarium supply section of Wal-Mart, work wonderfully in the bottom of a terrarium. 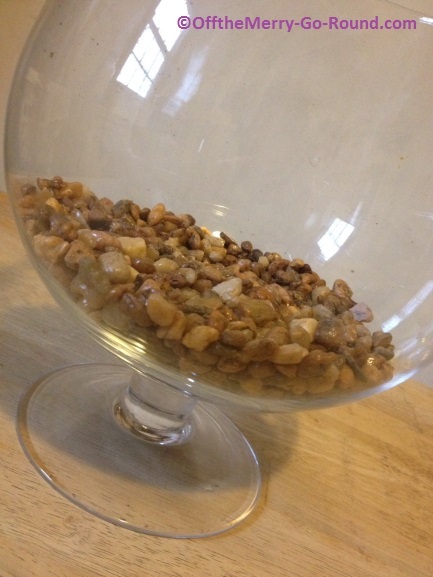 Spread a layer of rocks or gravel in the bottom of your container. 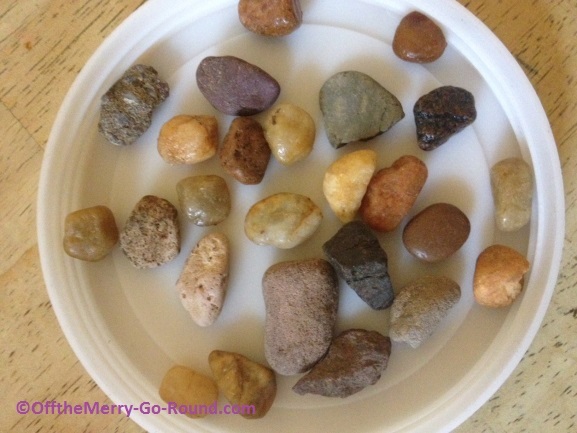 Set aside a few colorful rocks that catch your eye. Save them for decorative touches later. Next, spread a layer of potting soil and lightly sprinkle with a watering can. 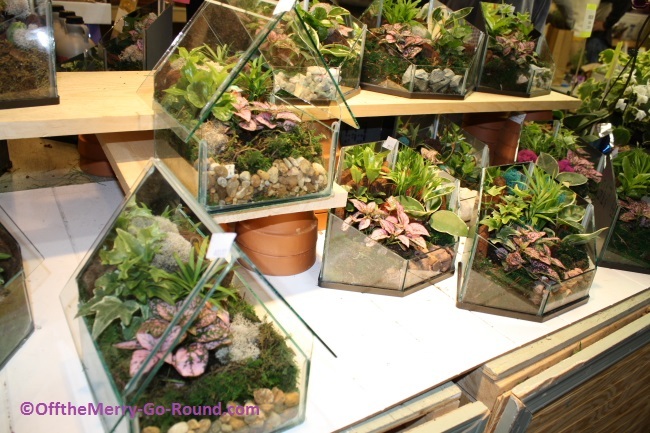 Place your plant(s) inside the terrarium and add potting soil around and in between them. 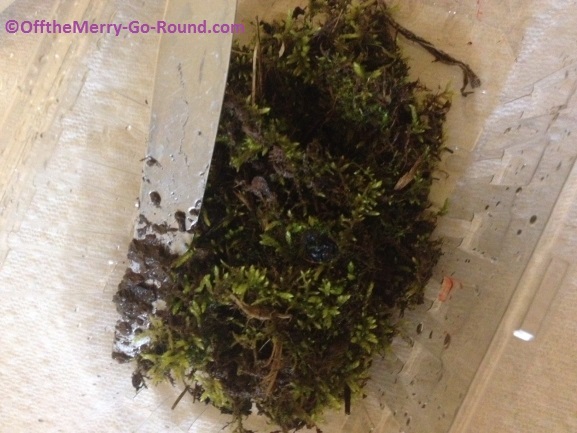 Add patch(es) of moss atop your soil. To be honest with you, in between winter snowfalls, I used an old table knife to carefully remove some from my yard. Add moss and decorative touches to the terrarium. Be creative! 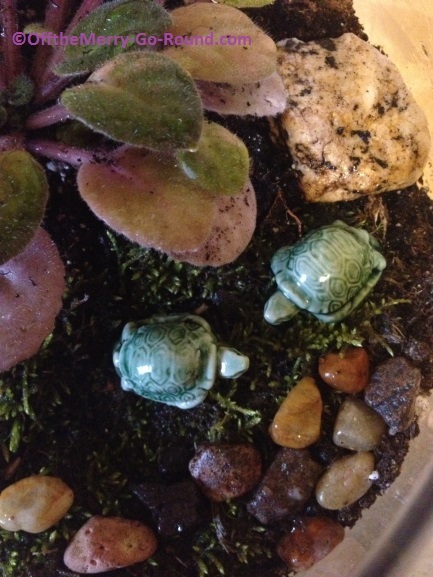 Little figurines such as these turtles add a touch of whimsy. 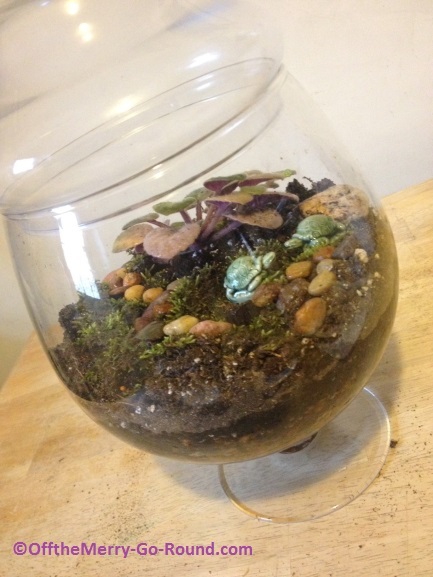 Our completed terrarium! Water lightly and place in a warm, partly sunny location. Additional tips: Don’t place in direct sunlight or your plants will burn. 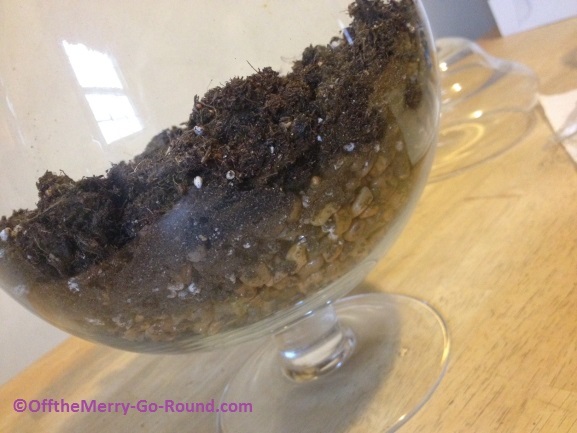 Remove any dead or decaying leaves so the terrarium doesn’t become diseased. Do not over water. As long as you see moisture and “clouds” inside your terrarium, you might not need to water it again for weeks or months. When you no longer see moisture, lightly water or spray mist inside the terrarium. Enjoy! Have you grown a terrarium? What tips can you add? Is there a wonderful garden show in your area that you can recommend to the Off the Merry-Go-Round community? Apples don’t fall far from the tree: I have two boys and everything revolves around food. I totally understand their need to ask me what’s for dinner first thing in the morning (with apologies to my mother for constantly asking), but that doesn’t mean I have to actually answer them. And no, we never end the day with lima beans. With that in mind, a little preparation every week goes a long way toward maintaining a lot of sanity—and it probably saves time and money too! I can’t remember exactly when I started planning meals for the week, but I can tell you it makes it big difference and whenever I fall out of the practice—chaos ensues. There’s no silver bullet or divine secret to meal planning—just takes a little time and creativity. I’m happy to share what works for me, and I encourage discussion on what works for you. Regardless of your work/home balance, from grocery store to dinner table, we are usually responsible for feeding the family. Who really has the time; why not make it as easy on ourselves as possible? • Collect recipes – Keep them in a notebook, envelope or box—doesn’t matter where, just as long as you can quickly scan through recipes of family favorites or easy one-pot dishes. 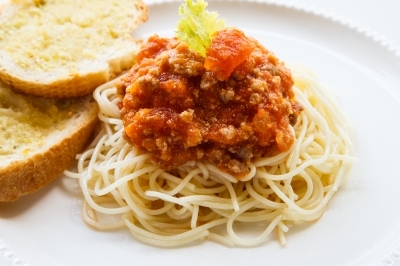 Research the web and ask friends for great recipes. • Find a planner – Go to AC Moore, Michaels, or your local arts-n-crafts or dollar store for a planner pad you can stick to the refrigerator. (My pink and black zebra print pad has seven columns so I can plug in the date.) You can use your computer or iPad, but I prefer old-fashioned paper because I can stick it on the frig where everyone has 24/7 access—which eliminates the “What’s for dinner?” Q&A…and, at times, the follow-up whining and complaining. • Plan for the coming week – I start by noting which nights have soccer or karate or meetings—dinner should be quick and easy on these nights. Before I go grocery shopping, I look through my recipes and/or store flyers to help keep the menu interesting and inexpensive. Cook enough for two nights when you can—eat half now and freeze the other half for later, so next week’s menu is easy to create and the only requirement is reheating. • Make the grocery list – Use the back of last week’s menu to write your shopping list. With recipes on hand, it’s easy to list everything you’ll need. Planning and shopping for the week saves time and money since I’m less likely to run to the store for a few items and return with a cart full…or resort to spending money on fast food. 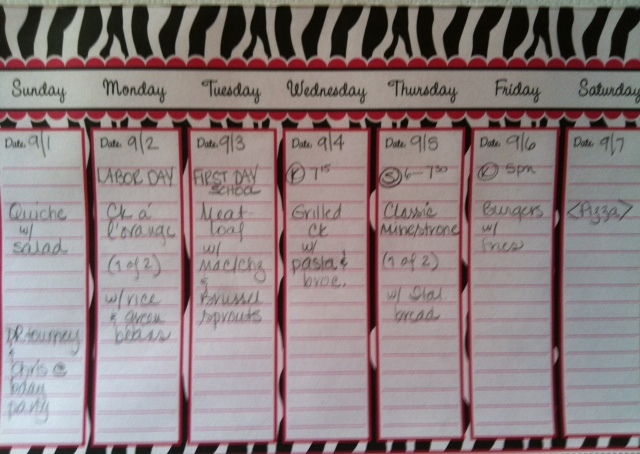 We definitely eat healthier when I take the time to plan for the week. That’s it! I fell out of practice during the summer, and by Friday evenings I was so frustrated with the questions about what’s for dinner and last minute planning that I didn’t care if anyone got dinner. (Note the snippy tone.) Now that school is back in session and the activities and sports are in full swing, planning is essential. And I actually like Friday evening dinners again. Here’s a delicious recipe for chicken that turns any dinner into a Sunday dinner without much effort. Add some rice or bread, microwave a bag of green beans and dinner is served. Please share your time/money-saving tips or a favorite recipe with everyone. Enjoy! 1) Heat oven to 425. In a large shallow roasting pan, toss the shallots with 1 tbsp oil and ¼ tsp each salt and pepper. 2) Cut the chicken into pieces. In a large bowl, whisk together the marmalade, vinegar, rosemary and remaining oil and ¼ tsp each of salt and pepper. Add the chicken; toss to coat. 3) Place the chicken mixture in the roasting pan, nestling the pieces among the shallots. 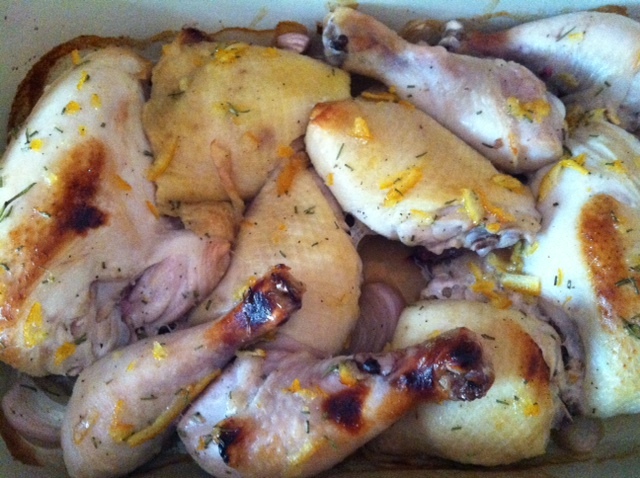 Bake until the chicken is cooked through and browned and shallots are tender, 25 – 30 minutes. If you’ve got a new college kid, by now she’s off at school. You’re likely adjusting to the quiet, doing a little less cooking and laundry—and walking past her empty room a couple times a day. About that room: It’s no longer in active use—at least her half of it, if your kids share. So what are you going to do with all that space? And all the stuff in it? Maybe you’re one of those parents who was tempted to stop by Sherwin Williams on your way home from dropping your freshman off at orientation, so you could set right to work repainting that room and converting it into a home office. Or maybe what you really want to do is shut the bedroom door and leave your kid’s room completely intact, as a memorial to his early days. Over the years I’ve been pretty laissez-faire when it comes to the tidiness of my kids’ rooms. My stance has been that the kids’ rooms are their domain, so they should get to decide how tidy to keep them—within limits, of course! So once the kids got old enough to help, I expected them to pitch in with the house cleaning when I asked them to, but I didn’t clean their rooms for them, and I pretty much let them decide how much or often to clean them—but no dirty dishes or uneaten food allowed! As it turns out, my daughter is pretty fastidious, but my son is, well, not. 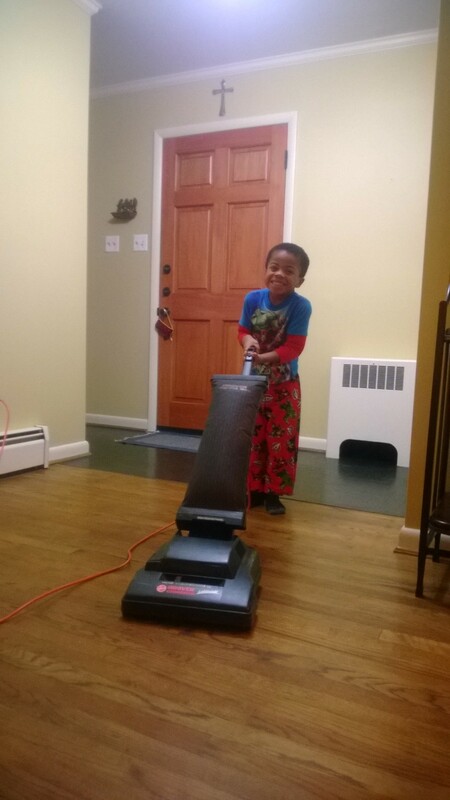 Certainly he’ll clean up if he needs to (like when his grandmother is coming to visit), and he vacuums his carpet regularly enough—but the place hadn’t been dusted in quite awhile. I have to admit that part of what got me through sending him off to college was the thought that I could finally get in there and wipe down his bookshelves! Now to be sure, we talked about it beforehand—I told him my intentions, because I didn’t want to invade his space unannounced. And so last weekend, armed with dust rags and wood polish, I addressed myself to his room, dusting off his dresser, bookshelves, and desk, carefully replacing his books and treasures where I found them, and resisting the urge to do much organizing or discarding. I kept in mind that this room is still his room, and the decision about whether to throw away those old movie ticket stubs is his to make, not mine. 1. Leave their room intact, at least for a while. For at least the first semester, it’s probably a good idea to leave your college kid’s room pretty much as-is, if you can. Of course it’s a different story if you’ve got younger siblings eager to expand into the empty space (see below). But otherwise, go ahead and do some dusting and tidying, but don’t change things around too much. They’ll be home before you know it for fall break and Thanksgiving, and you want them to feel like they’ve got a home to come home to. 2. Before you toss it out, talk it over. I’m a stickler for privacy and boundaries, so I won’t pick up anything more than a wet towel in my kids’ rooms without making sure they’re okay with it. 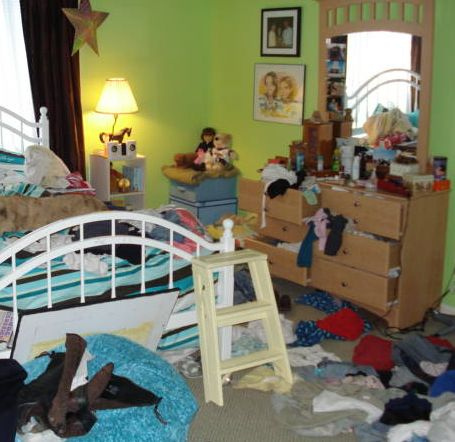 More reasonable parents might have a great routine for how much cleaning they do in their kids’ rooms. But regardless, before you go in there and start tossing out old school work or donating their Legos to the homeless shelter, it seems respectful that you’d check in with your college kid, preferably before she leaves home or during a break from school. You want to make sure you don’t accidentally throw out something precious to her—and you want to give her a chance to stash her journals, love letters, and anything else it’s really not your business to find. 3. Same goes for big changes. 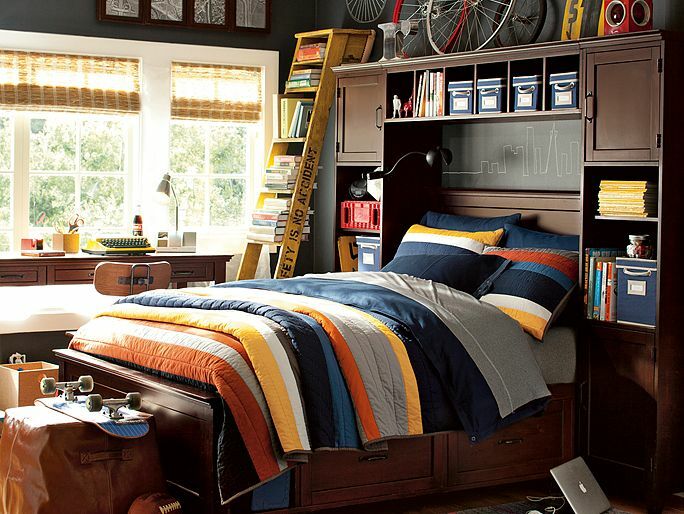 If you’ve got younger siblings who need the space your college kid has vacated, or if you really need to convert that room into a home office, be sure to talk it over with your college kid before you break out the paint brush. And make sure you reserve some closet space and a corner for her bed, or at least a sofa bed, so she’s got a place to sleep and stow her stuff when she comes home for winter break. 4. Be patient. Chances are that when your college kid comes home for Thanksgiving his room will already feel a little alien, the posters a little juvenile, and the old ticket stubs less meaningful. It could be that your kid will even help you do some decluttering over the winter holidays! 5. If you can, let them bunk with you until after graduation. While we don’t want our homes to become storage units for our absent children, letting our kids keep their claim to their bedroom real estate until they’re settled into their own apartment after graduation can pay off for you. It’ll make visits home less stressful—and more likely to be repeated—if your kid has a comfortable place to stay. It may also help your kid make smart choices knowing she’s got a safety net if she needs it, rather than rushing into just any housing situation because she needs one. And keep in mind that even though today it might feel like your college kid has moved out for good, the reality is she probably hasn’t—some studies find that well more than half of college graduates move home for at least a little while after commencement while they’re looking for work. How about you, empty nesters? What did you do with your college kids’ rooms after they left? And how soon did you do it? I’d love to hear your advice! Images: Messy room: Some rights reserved by Rubbermaid Products; Tidy room: Pottery Barn Teen. How to: Make Little Changes to Your Home to Create a Fab New Look! 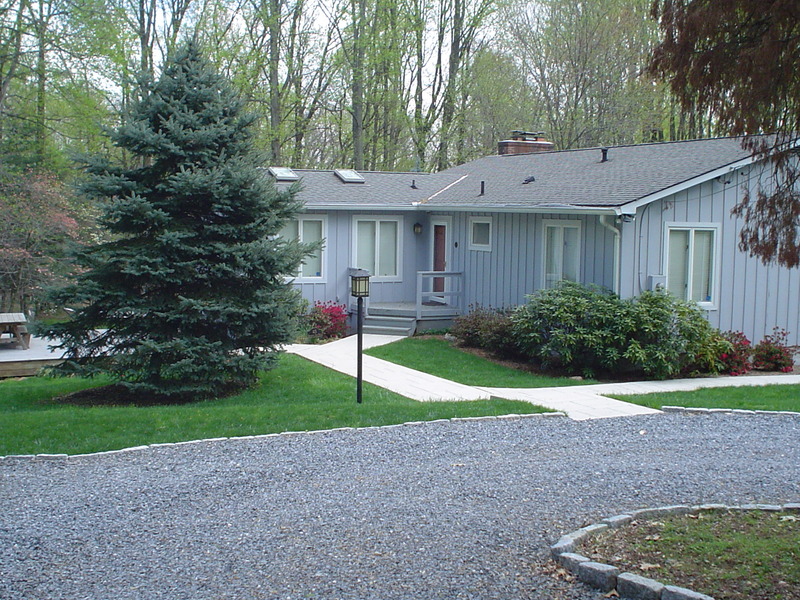 When we bought our home in 2006, we had a small house and BIG plans. We would take this quaint, though somewhat neglected, “bungalow” with barely-enough-room-to-squeeze-into bathrooms, tear it apart – one room at a time – and give it a (major) facelift! Then, without warning, life happened. You know what I’m talking about … transition into new job life; loss of new job life; kid on the way life; I wasn’t expecting that expense life. Suddenly, all the money those fancy renovations take to make happen wasn’t there. Big plans and shattered dreams. Or were they? Could this little house with great potential, yet in need of much work, ever become our dream chateau in the country? As it turned out, yes it did – and so can your home … no matter how small. It may appear otherwise, but few of us live in those sprawling 7 bedroom houses we so often drive by. Since we live in a Washington, DC suburb our monthly mortgage is more than some people pay for a mortgage and two car payments! Yet, at just 1,184 square feet, our house is very small compared to what most people would consider livable square footage. What we began looking for was balance. Balance between making our wish to turn our house into a home come true – and knocking down a wall to expand our square footage in order to achieve it! 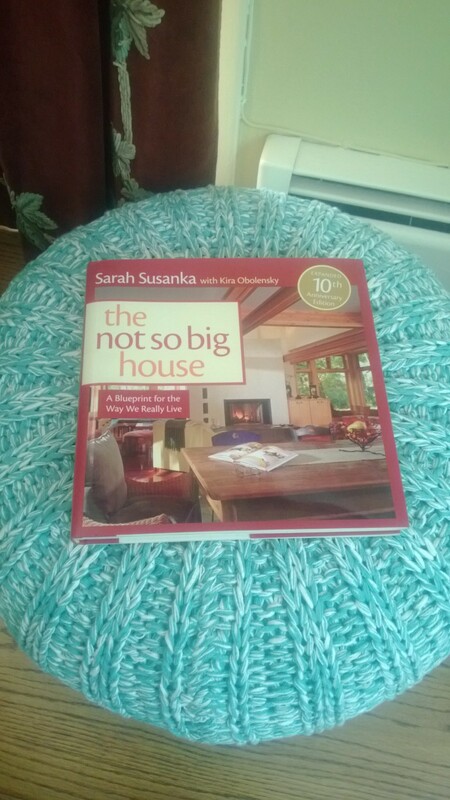 Just one of Sarah Susanka’s many helpful decorating books for small houses and spaces! Do you face the same dilemma, or just want to give one area of your house a “lift?” If so, use these tips and suggestions to get started on home renovations, upgrades, and design and decorating ideas you put off in the past due to cost and logistical concerns. + Read, research, and write/map out your ideas. When I put my researched ideas and creative thoughts on paper and carried them around my house as I considered them, I finally saw our ultimate dreams could come true. + Contractor is key. Hiring a professional, skilled contractor helps you get what you ultimately want and gives you peace of mind in the process! I believe in the “don’t try this at home” philosophy. Painting the walls in your guest bedroom is one thing – creating arched entrance ways or installing crown molding is entirely different. I don’t want to discourage checking references, yet keep in mind that these (and even photographs of project work) are easily faked. We no longer check references for things such as paint jobs and house cleaning services. Instead, when we find a service provider we like, we hire them for a small, less significant job first to see how that goes before launching into a bigger project. We also never give a payment “upfront,” and always make sure one of us is home during the work phase. We hired an experienced gentleman who tended toward a perfectionist nature. He took a little longer than another contractor might have, however he finished the job in a reasonable amount of time. He was upfront and honest, produced what we wanted, charged just for materials and time, required only smaller payments throughout the scope of the project, and provided invoices with a service/cost breakdown. + Proceed slowly and with caution. No matter how well thought out and prepared you are, little glitches do happen along the way. It is easier to add something to your project than take it away so consider your plans carefully! + Do it right the first time. The do-it-yourself projects of previous owners created the need for a good bit of repair and renovation on our house that would not have been necessary if handled properly the first time. When the bathtub in our son’s bathroom needed new piping, we were unable to get to the pipes from the access door located in his bedroom. Shelves, in the form of sloppily sawed wood boards painted white, had been nailed directly over it! Needless to say, those are no more. If you do it right (and well) the first time, it really will last forever! + Live with it! Once you have a renovation idea, think about it for awhile. Make the project come to life in your mind and then once complete, live with it before moving on to something else. We did not add objects to our beautiful new hallway display case until a “theme” came to mind a few weeks later. We have many options for showcasing items in our new built-in display case. + Simply updating furniture and accessories can change the look of a room. 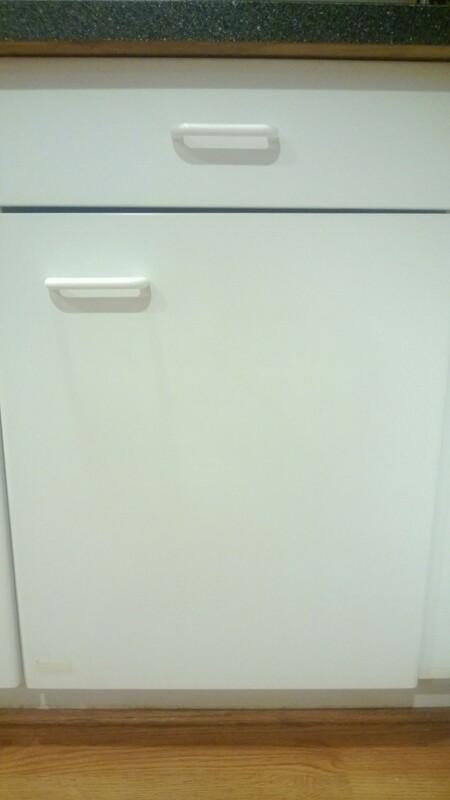 Rather than spend thousands of dollars to replace the white IKEA-style cabinets in our kitchen, we unscrewed the thick plastic white handles and installed simple silver ones we picked out at our local hardware store. 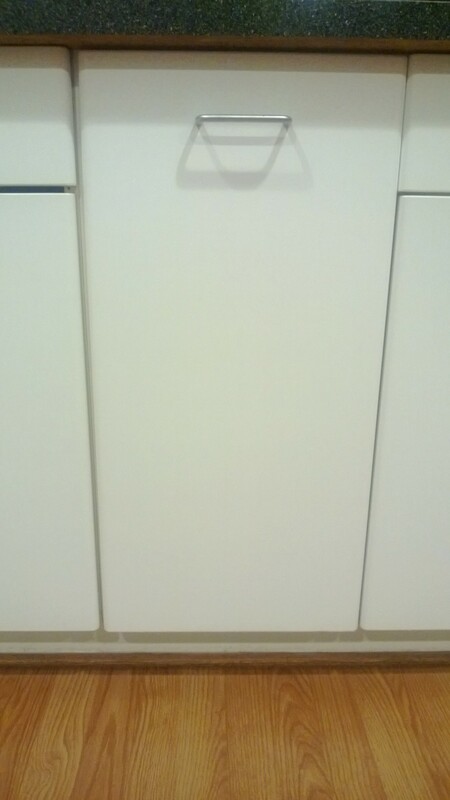 This little change immediately gave the cabinets a sleeker, updated look for little expense and effort! + Small touches make a big difference. When redecorating, you may wish to keep the essence of your original home. Built in the early 1960s, our house has elements of the “retro” style popular then and remnants from the more simplistic era of do-it-yourself home projects. We gave a “nod” to our home’s original style – for example, leaving the tiny square floor tiles in the upstairs bathroom, and keeping the homemade closet shelving in the bedrooms. We created a more current look throughout our house by tweaking the appearance of what we chose to keep and adding fresh, modern paint colors to the walls! + Let your interests inspire your decorating, not overwhelm your surroundings. Part of turning a house into a home is reflecting your interests, cultures and memories. We have an affinity for Native American culture, value nature and the outdoors, and feel connected to our son’s African American heritage. Rather than clutter tabletops and shelves, and cover every inch of wall space, we share our interests by carefully choosing and arranging items of special significance. As an example, we enjoy our beautiful native bird species so a mysterious painting of an owl waiting out a storm hangs on one wall, a custom-framed arrangement of birds common to our woodland property is clustered on another – and we left the rest of the birds outside! A good friend has also successfully incorporated this decorating tip. When you visit her home, you see what holds meaning and value to her family on display in a corner dining room china cabinet. Rather than being haphazardly scattered throughout her house, these treasures are enjoyed in one special place. + Your house and its appearance is a reflection of you. De-clutter! Purge thy surroundings! If you haven’t looked at it, worn it, remember where you got it, or even thought about it in a year – it’s time to toss it! If you feel you really can’t part with that stack of “antique” books old Aunt Martha passed along to you, arrange them in front of a pretty backdrop, take a photo, and put it in a frame to display on your end table. Now send those books a-packin’ down to the local book store. You might even get some extra spending money in exchange! Another easy way to cut down on “stuff” in your house is to regularly sign up for charity pickups; we do that monthly. When I know a donation truck is coming, it makes it so much easier to get rid of unused items – after all, I have to give them something. I keep an empty box in the corner of my office at all times, drop things in as I purge, and there you have it – an instant tax write-off! Everyone has their own decorating style and sense of what “looks good.” My husband and I just happen to be super-organized, and like clean lines and well-defined, clutter-free spaces. Our home renovations and decorations reflect this. As you consider what you ultimately want your home to look like, consider your personality, interests, how you live – and design your home accordingly. Use some or all of the above tips to get started, yet remember that the most important thing is that your house feels like home! Our “new and improved” Home Sweet Home! Do you have additional decorating tips and renovation stories you can share with our community? Many people begin work on home projects in the spring and summer so please join the conversation!